The Inverse Email Law: Every email you send is the least important email that the person receiving it will receive today. 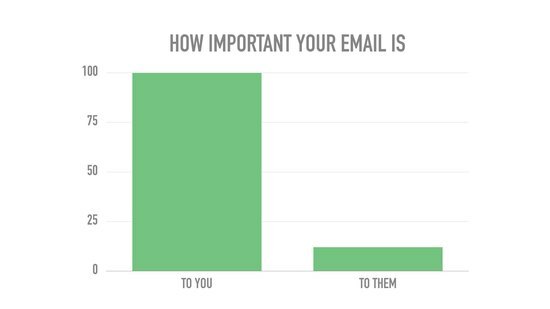 But, to you, it may be the most important email you send that day. Why: When you email someone, you’re asking something them from. You’re asking for their time and attention or you’re asking for them to do some action on your behalf. When you’re asking someone — a stranger, a friend, etc. — to do something on your behalf, it’s easy for us to misalign the value of the email. Again: Every email you send is the least important email that the person you’re sending it to will receive today. What does that mean for the emails that you send? How do you overcome the Inverse Email law? You Focused. Use you focused (http://kaidavis.com/you/) language to make the email talk to the person you’re emailing. ‘Invite The No.’ Invite the no by asking them if they aren’t a good fit for what you’re proposing. Let them tell you they aren’t a good fit..
Short. Actionable. Clear. Communication. Your emails need to be short and actionable and clearly communicate what you’re looking for. Strong Call to Action. Indicate exactly what the next step is. If you want to learn more about writing emails that stand out as ‘must reply’ emails, then you should order a copy of The Outreach Blueprint (http://outreachblueprint.com). Provide 2-minutes of value. Before you click send, ask yourself ‘If this email will take them 2-minutes to read, will it provide them with at least 2 minutes of value?’ If no, then don’t send it.